290 pages | 23 B/W Illus. The essays, research studies, and pedagogical examples in this book provide a window into the embodied dimensions of literacy and a toolbox for interpreting, building on, and inquiring into the range of ways people communicate and express themselves as literate beings. 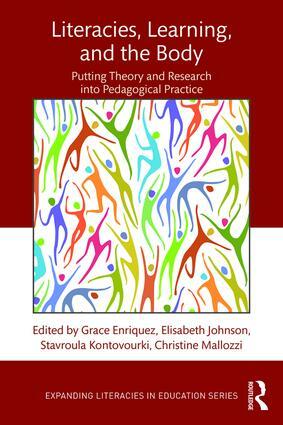 The contributors investigate and reflect on the complexities of embodied literacies, honoring literacy learners and teachers as they holistically engage with texts in complex sociopolitical, historical, and cultural contexts. Considering these issues within a multiplicity of education spaces and literacy events inside and outside of institutional contexts, the book offers a fresh lens and rhetoric with which to address literacy education policies, giving readers a discursive repertoire necessary to develop and defend responsive curricula within an increasingly high-stakes, standardized schooling climate. Grace Enriquez is Associate Professor, Language and Literacy Division, Lesley University, USA. Elisabeth Johnsonis Associate Professor, Literacy, St. Edward's University in Austin, TX, USA. Stavroula Kontovourki is Lecturer, Literacy and Language Arts Education, University of Cyprus. Christine A. Mallozzi is Assistant Professor of Literacy Education, University of Kentucky, USA.